Satirical News: Chinese Government Sends Its Agent Codenamed "Damulag" with An Army of Thugs to Beat Up President Nobita and Other Stupid Pinoy Politicians! President Nobita's pleas for mercy falls into deaf ears as Damulag beats him up! 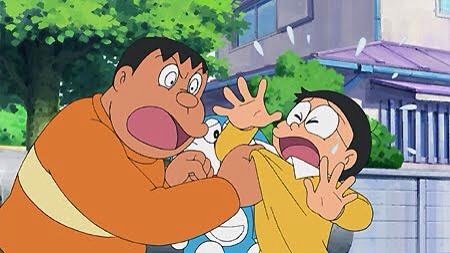 After Nobita had just been happy go lucky and Toady Casino passed the Anti-Chinese Bill in response to China's bullying of the Philippines with the Spratlys claim, China was utterly outraged and sends Chinese goons to beat up President Nobita for his irresponsibility. A guy who is codenamed "Damulag" (real name Du Ma La as confirmed by Chinese government officials) was sent to the Philippines with an army of thugs from China to beat up President Nobita and other stupid Pinoy politicians. As said, never mess around with the awakened dragon and President Nobita learned it the hard way. His refusal to apologize to China for the mishandling of the Pinoy National Police of the Rolando Murderza incident was just one of the many reasons why Damulag was sent to beat him up. While President Nobita was on one of his day-offs, Damulag went to assault President Nobita by himself proving how pissed off China is against the Philippines. At the same time, President Nobita's incompetence was shown to be worse than people thought. In contrast to Chinese in the past, Damulag is actually 8 feet tall and has been paid by the Chinese government to be one of its most effective brute enforcers. One of the reasons why President Nobita was targeted by the Chinese government was because he tried to enter China despite the ban being placed on him and VP President Jejemon Binay. President Nobita wanted to free the Pinoys who were responsible for the "Violationa/Non-Credo/Bitayin Day" incident in China where Pinoys wanted to avenge the deaths of the three drug mules. What was also known was that Damulag was also responsible for raiding various factories in China where bootleg and counterfeit goods were produced including the melamine incident leading to the deaths of Chinese involved in the incident. Doraemon was last seen carrying a badly injured President Nobita. Based from a recorded conersation, Damulag who was sent by the Chinese government said he does not hate all Filipinos only President Nobita and other incompetent government officials. He told the Filipinos not to worry since he's only after President Nobita, members of Bobo Muna especially its leader Toady Casino, Anak ng Bobo and Migraine International. At the incident in Makati, President Nobita tried to yell for help but the Pinoy National Police were all busy doing nothing like watching TV, womanizing, getting drunk, taking selfies, chatting on Facebook, watching ABias-CBN and playing computer games. What happened was that the Pinoy National Police arrived too late as Damulag had already beaten up President Nobita rather badly. President Nobita is currently confined at the St. Luke's the national getaway hospital for politicians. Due to the incident, Toady Casino foolishly declared to let Damulag fight him. Damulag wanted to beat up Toady Casino for passing the Anti-Chinese Bill and provoking them at Spratlys via Bobo Muna members. What was last known was that members of Bobo Muna went to Spratlys swimming around it to provoke China into leaving aside from the infamous March 30 incident. Unfortunately, China did not take it too well and attacked without mercy. Those who were caught swimming at the waters near Spratlys were all gunned down by the Chinese navy to prove you do not mess with the awakened dragon! Damulag was last seen beating up some members of Bobo Muna at Spratyls and he even beat them to a pulp to the point that they died. Toady Casino had not much luck either as Damulag is known as China's "unstoppable Juggernaut" was also sent to deal with him. Members of Bobo Muna all got injured fighting Damulag and his army of thugs. Toady Casino was beaten up after he refused to repeal the anti-Chinese bill which he passed a month ago. He also attacked members of Migraine International and Bobo Muna who caused trouble in China last March 30 this year. Toady Casino was slammed rather heavily by Damulag who then sent him to a Chinese-owned hospital after injuring the former. Toady Casino was last seen demanding himself out of the local Chinese-owned hospital to be transferred to the barrio to be cured by an albolaryo but the doctors refused his request due to the injuries Damulag had given him were pretty severe. Others that were assaulted where VP Jejemon Binay, Tito Stupid, Bongbong Bastos, Unggoy Ejercito, Ramon "Bong" Reviler Jr. and Juan Ponce Enriche who are also all confined at St. Luke's Medical Center after President Nobita was admitted. Their bodyguards could do nothing against Damulag's juggernaut power and have been sent to other hospitals as well. Ramon "Bong" Reviler Jr. still insists on going to Israel on Holy Week despite doctors telling him that Damulag's assault on his life need some time to heal. Meanwhile Tondo's de-facto leader Blob swears to fight off Damulag. However Damulag just said in English, "Me want to beat up Blob Blabbersky! Let's see how those Tondo squattes will stand a chance against the Chinese army!" Damulag will have no plans yet of leaving the Philippines until he has beaten every last stupid politician and said, "Filipinos should have done this YEARS AGO!"